Mortgage lenders … deliver pools of mortgage loans to us in exchange for Fannie Mae MBS backed by these loans. After receiving the loans … we place them in a trust that is established for the sole purpose of holding the loans separate and apart from our assets… Upon creation of the trust, we deliver to the lender (or its designee) Fannie Mae MBS that are backed by the pool of mortgage loans in the trust and that represent a beneficial ownership interest in each of the loans. We guarantee to each MBS trust that we will supplement amounts received by the MBS trust as required to permit timely payment of principal and interest on the related Fannie Mae MBS. We retain a portion of the interest payment as the fee for providing our guaranty. Then, on behalf of the trust, we make monthly distributions to the Fannie Mae MBS certificateholders from the principal and interest payments and other collections on the underlying mortgage loans. The U.S. Congress chartered Fannie Mae and certain other GSEs to help ensure stability and liquidity within the secondary mortgage market. In addition, we believe our activities and those of other GSEs help lower the costs of borrowing in the mortgage market, which makes housing more affordable and increases homeownership, especially for low- to moderate-income families. How noble! They lower the cost of a morgtgage by, well, buying lots of them and lowering rates. Why do they buy so much? so they can lower rates. Easy to understand, right? The reason they do this is to help increase home ownership. Interesting, then, that their business volume in 2007 had 11% investor properties or second/vacation home (see table 41, here). Also interesting, then, that 32% of their business was lending for cash-out refinancings (same table)–those don’t seem to be helping home ownership, and actually reflect a higher risk segment of mortgage loans. So, Fannie and Freddie own a huge amount of their own product, which is notoriously difficult to hedge, have bought a lot of product fore the sake of buying, and seem to have a portfolio composition that is slightly different from it’s purpose… Well, holdon. It gets even better! 3. 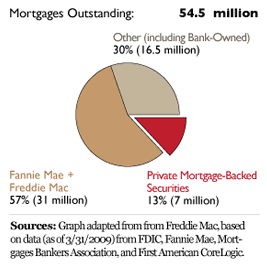 Fannie and Freddie were the largest buyers of sub-prime mortgage bonds and commercial mortgage-backed securities. Look at any securitization, look at the AAA-rated portions, and if there is a class that is all loans considered “conforming balance” or have amounts that generally conform to the agencies’ maximum loan size limits, then you know those were purchased by an agency. At the end of 2007 Freddie owned $100 billion of these sub-prime securities (according to OFHEO, page 43, pdf) where 21% of loans were 60+ days delinquent. Fannie Mae has about 13% of it’s portfolio, which was an average of $725 billion during 2007 (from their filings), or $94 billion. Now, if regulators understood these products, they would understand that securitizations are structured in a way that Fannie and Freddie could be at risk for a decline in value of their own securities that occurs from the performance of the other assets–the ones that have nothing to do with their goals and charter. I would even challenge anyone who thinks that congress would agree with the programs that Fannie and Freddie use to support their mission … I’ve been on calls with people discussing how Fannie and Freddie merely need to be able to claim something passed the most cursory of tests to take on a $1+ billion loan. Providing the opportunity to afford housing to credit worthy indivisuals has nothing to do with buying CMBS and sub-prime RMBS. What does all this point to? Seemingly a massive amount of “mission creep” for the agencies that lead them to be over-levered, in increasingly risky products, and in an accounting and hedging nightmare.